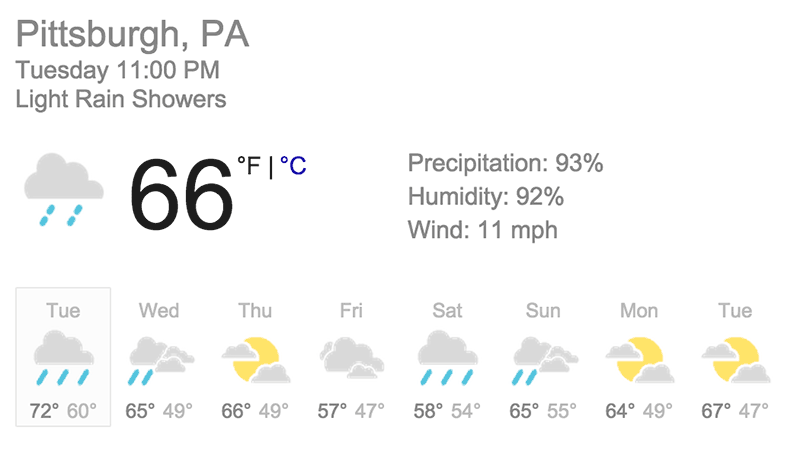 Here’s the weather for the coming week, here in Pittsburgh. Let’s create a simple visualization of the daily high and low temperatures. If something is worth doing, it’s worth doing well, and if you’re visualizing data, it’s always a good idea to add axes, labels, and a scale, so that the values can be read easily. Here’s the same data as above, but plotted to enhance the legibility of the data (for example, by stretching the vertical display range). Note how we use the handy map() function in order to stretch the data to the range we want, and how the entire graphic is able to scale dynamically with the canvas. In the next example, we exclusively focus on the daily high temperatures. We wish to find out which day has the coolest (lowest) high temperature. To do this, we have to search through all of the data in the array. This is a really important pattern. In the next example, we search for the day of the week, which has the least difference between its high and low temperatures. Note how we use functional abstraction in this example. The whale, at 120 million grams, is more than 2 million times more massive than the chick. In order to display such values on the same screen, we take the log() of each value before displaying it. You can see this when you click in the sketch below. There are three kinds of copies: shallow (top level, by value), reference (shared) and deep (complete, by value). A reference copy, on the other hand, acts like a nickname or alias for the original. Suppose you have a nebbish friend named Walter. Now suppose there’s a school bully, and you hear him bragging that he gave “Wally” a painful wedgie. Should you be concerned for for your friend Walter? Yes, yes, you should. In the example below, a shallow copy and a reference copy are made from an array of numbers. When the user presses ‘A’, it reverses the shallow copy. When the user presses ‘B’, it reverses the reference copy. Observe how the original is affected (or not). A deep copy comes into play when an array contains another array or objects. Consider an array of arrays: [[1, 2], [3, 4]]. A shallow copy would copy the elements [1, 2] and [3, 4] by reference, so these would be shared between the original and the copy. To make the original and copy completely independent, you need a deep copy, which will make new independent copies of the arrays [1, 2] and [3, 4].